Eating right can get boring sometimes and feel restrictive. But, with a few tricks, a noodle dish tossed with a delicious savory peanut butter and ginger sauce can be enjoyed guilt free. 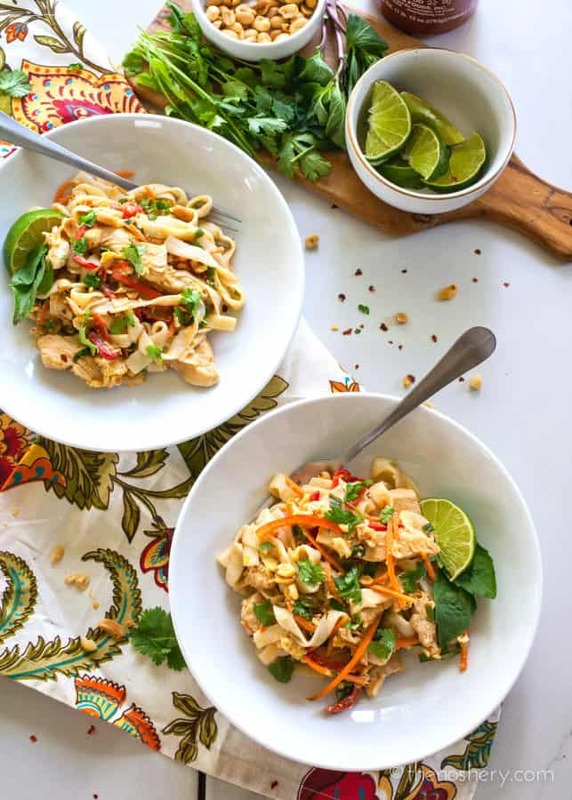 This Thai peanut noodles with chicken dish is one of my favorite easy and healthy weeknight meals. It’s gone through a few tweaks in order to make it as light as possible without sacrificing flavor. One of the things I played with the most were the noodles. Vegetable noodles are all the rage right now but, I couldn’t find a vegetable noodle that didn’t conflict with the Thai flavors in the sauce. Sweet potatoes came close but, when you’re counting your carbs sweet potatoes aren’t the best way to go. I did a little research and discovered shirataki noodles. Since my discovery, I always have a few packages of shirataki noodles in my fridge. They are great if you are watching your carbs, craving pasta, and need to get dinner made fast. If you have never heard of shirataki noodles you are in for a treat. Shirataki noodles come from a yam-like tuber called Devil’s Tongue. The glucomannan starch is extracted from the tubers and mixed with water and limewater. This creates a substance called konnyaku. The konnyaku is then shredded into shirataki noodles. Sometimes soy is mixed in and they can be called tofu noodles. The great thing about these noodles is that they are very low calorie and carb free. The noodles can be found bagged and packed in a liquid in the refrigerated food section, usually where vegan alternatives are sold. They are pretty close to flavorless so they absorbed whatever flavors they are prepared in, which makes them great in any noodles dish. Another thing I wanted to conserve were fats. But, I love me a Thai peanut sauce. Unfortunately, peanut butter is high in fat. Good fat, but still fat. That is when peanut butter powder comes to the rescue. You get all the peanut flavor with 80% less fat. I love peanut butter powder! Finally, I decided to use coconut aminos. Coconut aminos are a great soy alternative. It has a deep savory flavor like soy sauce with a little sweetness, less salt, and it’s naturally gluten-free. If gluten or soy isn’t your concern you can use soy sauce in its place. When I prepare this dish I like to make a double batch for lunch leftovers. I find that as the noodles sit and refrigerate they develop more flavor. You can even enjoy the noodles cold if you like. This is a grat dish if you are wanting to load up on protein and conserve carbs and fats. It’s a dish that’s incredibly easy, flavorful, and can be enjoyed by the whole family. I bet they won’t even know that it’s good for them. Trust me even my bacon loving, gluten obsessed husband to ask for second and thirds. 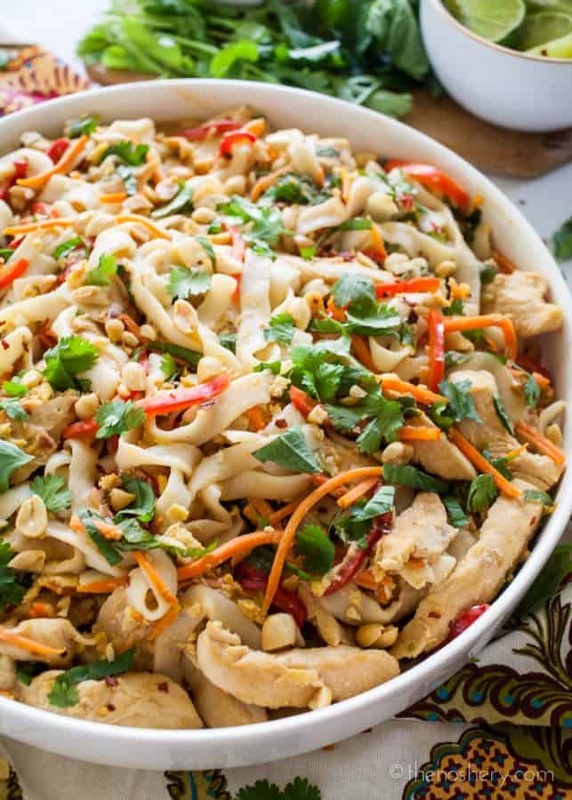 Enjoy all the Thai peanut noodles flavor and none of the guilt. So easy to prepare this dish is the perfect weeknight dinner. 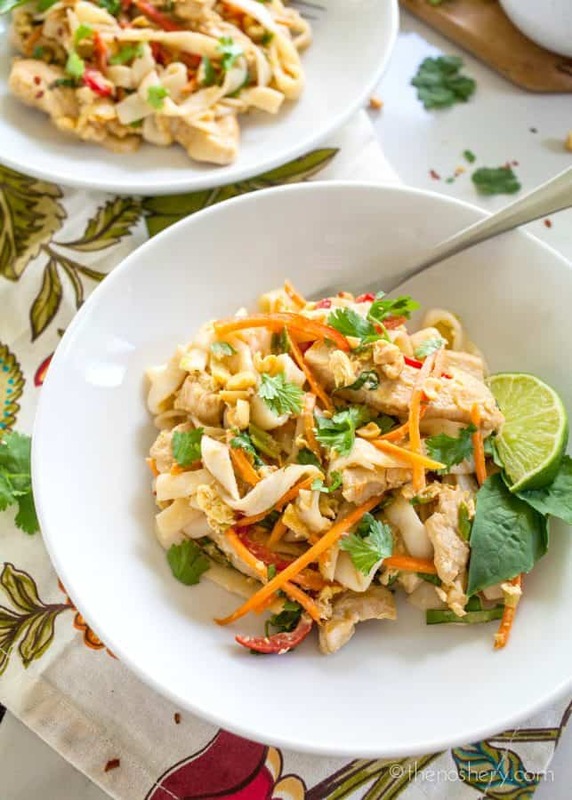 In a small bowl whisk together peanut butter powder, coconut aminos, ginger, garlic, lime juice, chicken stock, sriracha, rice vinegar, and fish sauce, set aside. Drain noodles in a strainer and rinse under cold water. Leave noodles in the strainer over sink or bowl to drain. Season chicken breast with salt and pepper. Heat a non-stick skillet over medium-high heat, spray pan with cooking spray. Working in batches brown the chicken and transfer to a plate. Spray the pan with cooking spray as needed. Spray pan with a little cooking spray, add green onion, carrot, and peppers. Saute, for 4 minutes. Push aside and add eggs, scramble and stir until cooked through. Add peanut sauce and chicken, toss to coat. Bring sauce to a simmer for 3 minutes or until sauce thickens. Add noodles and cilantro, toss until evenly coated. Divide noodles evenly among 4 plates. 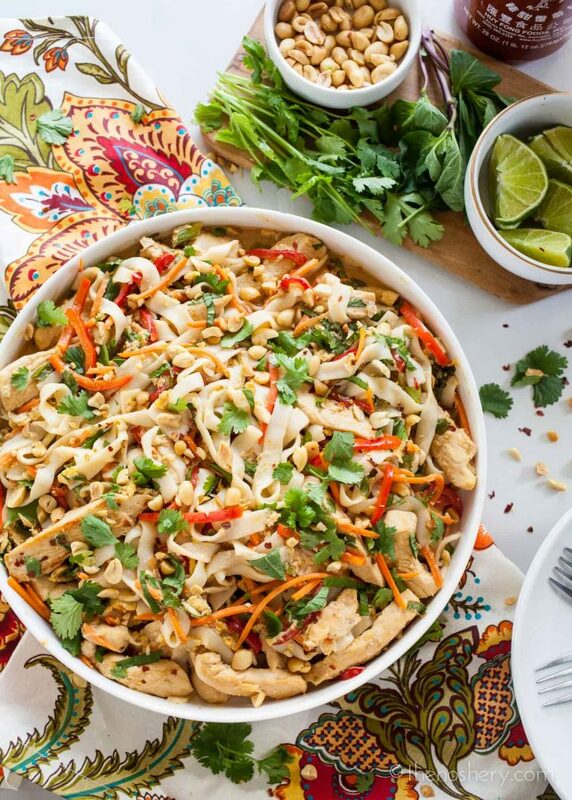 Sprinkle with crushed red pepper, chopped peanuts (if using, remember to adjust the calories), and garnished with torn Thai basil and lime wedges. This was sooooo good! Thank you thank you thank you! My husband said it was the best thing I’ve made in a while! WooHoo!